If the court has ordered you to take an Arkansas court-approved defensive driving course (also referred to Arkansas traffic school), you're in the right place. Our online Arkansas Defensive Driving course is the easiest way to dismiss your traffic ticket and satisfy court-mandated requirements. Our simple, fast, and convenient course lets you skip four hours of boring classroom lectures. Get started now! You can also take our Arkansas Defensive Driving online course for auto insurance discounts. Be sure to check with your provider before registering to make sure they offer discounts for drivers who complete a state-approved Arkansas defensive driver course. 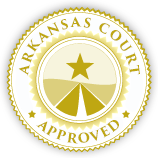 Our Arkansas Defensive Driving course is approved for all Arkansas courts. For more court-specific information, see our How it works page. Why choose our online defensive driver course over other providers? Why take an online course instead of a traditional classroom course? Your time is valuable. Why sit a classroom for four hours? Take our Arkansas Defensive Driving course online on your schedule, not an instructor's. Learn at home your way, on your time. It's the fastest and most cost-effective way to take care of your ticket and satisfy the court. Start today by registering online. You can begin the course immediately as soon as you register. For help with the process, just contact us and we'll walk you through it. Read more frequently asked questions about Arkansas Defensive Driving here.